Today we wanted to talk about eggs. You will be surprised to learn how big industries use clever marketing strategies to boost the sales of their products. One technique is called “unique positioning,” which involves highlighting a particular nutrient which is plentiful in the product. For example, when calcium is mentioned, we think of milk and cheese. Omega-3 fatty acids are synonymous with eating fish, iron with beef, and eggs are well known as the “best source of high quality protein. A little protein is good, but more is not better. Protein consumed beyond our needs is a health hazard as devastating as excess dietary fat and cholesterol. This is one of the reasons why for more than 40 years the US government had warned us about eggs being unhealthy and unsafe; according to the past USDA regulations, the egg industry couldn’t use the word ‘safe’, ‘nutritious’ (they have so much cholesterol you couldn’t even say they contribute nutritionally), ‘healthy’ or ‘healthful’ (under FDA rules, a food is healthy if it is low in saturated fat, eggs fail that test since they have more than 90mg of cholesterol per serving), or say ‘eggs are good for you’, and even that “eggs are an important part of a well balanced, healthy diet’. However, don’t let this confuse you; these guidelines differ from a scientific panel report that had endorsed a vegetarian diet as one that was best for human health and more sustainable for the environment. The latter point led some members of Congress to question the politicisation of the guidelines. 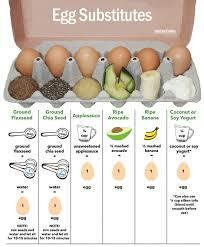 If you’d like to reduce your consumption of eggs, the below useful table with baking substitutions will help you!